Normal prostheses are not designed to get wet, whether in the shower, pool, or ocean. There are shower/swim prostheses on the market, but often the cost of obtaining one is not covered by insurance, and too expensive for the patient's budget. But a new option is available. An entrepreneur with a background in industrial engineering founded a company called Standard Cyborg, which manufactures custom waterproof leg prostheses - the Water Leg - through a 3D printing manufacturing process. 3D printing also known as additive manufacturing is any of various processes used to make a three-dimensional object. In 3D printing, additive processes are used, in which successive layers of material are laid down under computer control. These objects can be of almost any shape or geometry, and are produced from a 3D Model or other electronic data source. At Standard Cyborg, the process begins either working with a client's prosthetist or directly with the client to get the exact dimension of their current prosthetic device. It is modeled and sent to a high-end 3D printer to get fabricated. Then, an aerospace-grade carbon fiber material coating is added to ensure the strength and safety of the device for the amputee wearing it. All Standard Cyborg's prosthetics are custom-made; the final lamination process takes two hours and is done by hand. It is 100 percent waterproof, dries quickly, and has a Vibram non-slip sole. While first designed as a shower leg, it can be used in sandy and salty conditions. Its easy donning and doffing means it also facilitates middle of the night trips to the bathroom. The Water Leg can be put on in under 10 seconds, making it the perfect device for doing quick simple tasks around the house, avoiding the need to put on a more time-consuming prosthetic. Jeff Huber, the inventor of the Water Leg, was born with fibular hemimelia, eventually resulting in an amputation below the knee when he was a toddler. As a child, he would receive a new leg every nine months or so, but as an adult insurance typically covers a new leg every three to five years. For a high activity level amputee, prostheses can run in the five figures. 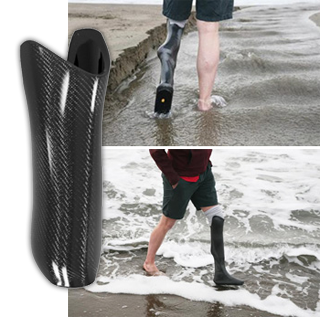 With that being the case, most amputees do not have the luxury of specialty legs for use in the water or at the shore. 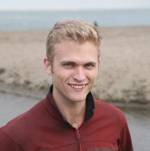 With his background in mechanical engineering at North Carolina State University, and entrepreneurship drive, Huber wanted to create a waterproof leg at an affordable device. Backed by the seed fund Y Combinator, Huber began experimenting with 3D printers and various plastics. He eventually found the blend of traditional techniques to form a plastic covered with carbon fiber. Standard Cyborg is still in its early stages, but with nearly two million amputees in the U.S., there is a huge potential for an affordable waterproof prosthesis. Please feel free to submit your questions on the Standard Cyborg - Inexpensive Waterproof Prosthesis as well as any other issue you would like addressed.